MILWAUKEE, WI – Milwaukee Tool continues to expand its M12™ LITHIUM-ION system with the introduction of the new M12™ Variable Speed Polisher/Sander. Optimized to provide the fastest and most precise detail work, the new tool performs the work of two tools in one by easily switching between polishing and sanding modes. Featuring Dual Mode Control and a variable speed trigger, the M12™ Polisher/Sander delivers increased user control, regardless of the application. A tool-free accessory change allows the user to quickly change between polishing and sanding accessories. 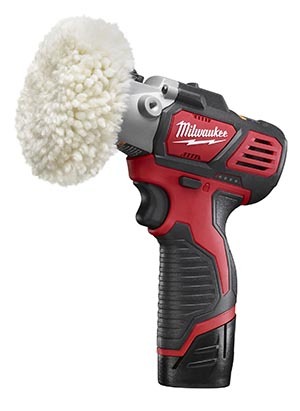 Powered by any Milwaukee M12™ LITHIUM-ION battery, the new tool delivers the performance professionals have come to expect from pneumatic polishers without the burden of a hose and compressor. On just one battery charge, the M12™ Polisher/Sander can perform a full pass on exterior trim, which was not possible with cordless units in the past. The new tool is also compatible with the entire M12™ System, now offering over 60 cordless Lithium-Ion products. Milwaukee® is committed to the ongoing development of this platform and will continue to provide innovative solutions that offer industry leading reliability, performance and ergonomics.